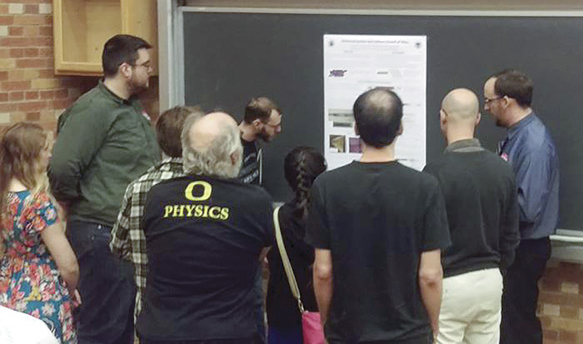 This year the Zone 17 Meeting was held at the University of Washington (UW) in Seattle. When asked if UW was interested in hosting this meeting, we recognized it was a very large responsibility, but our chapter felt up to the task. We saw hosting the event as an opportunity to develop our leadership and team-building skills while sharing a lot of great activities and developing a better sense of community with the other chapters in our zone. Planning the zone meeting required a great team effort from our chapter. We decided to focus on events that were fun, yet educational, and then to work in teams to develop activities. One of our planning teams developed a very exciting physics demonstration show. After riding in on a cart propelled by a fire extinguisher, they showcased our Wimshurst machine, ping-pong cannon, and many other fascinating contraptions. We even got to play with some liquid nitrogen and demonstrate the Meissner effect. Another of our teams was in charge of presentations. We had four presentations in total, two from UW faculty members and two from undergraduate attendees. One of the highlights was the presentation by an undergraduate member of our club, Kyle Roberts, who gave a very entertaining talk about his research at the HIT-SI fusion reactor here at the UW. Some of our other teams focused on lab tours, food, and social aspects of the meeting, such as a game of Physics Jeopardy. The meeting was a great opportunity to learn more about each chapter’s activities throughout the preceding year. This allowed us to build relationships that will help coordinate events in the future. For example, representatives from Central Washington University and the University of Oregon came with us on a tour of LIGO in May. This event was attended by five different chapters from Zone 17, with more than 50 attendees overall.